Celebrating National Water Park Day at Typhoon Lagoon! 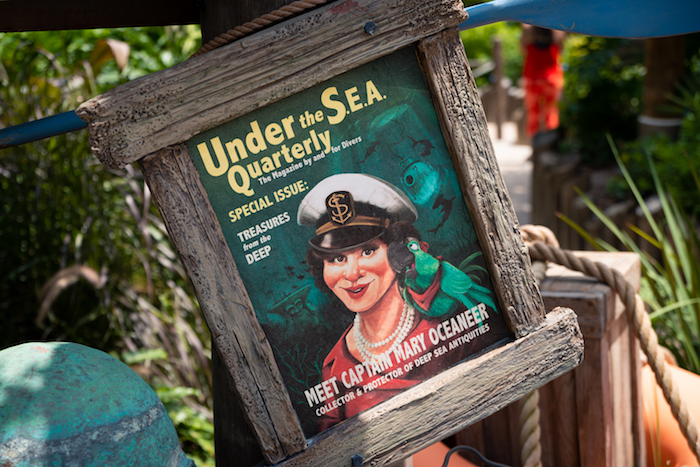 Join us for a photo tour of Typhoon Lagoon, one of Disney’s two refreshing water parks! Typhoon Lagoon. Photo by Courtney Reynolds. 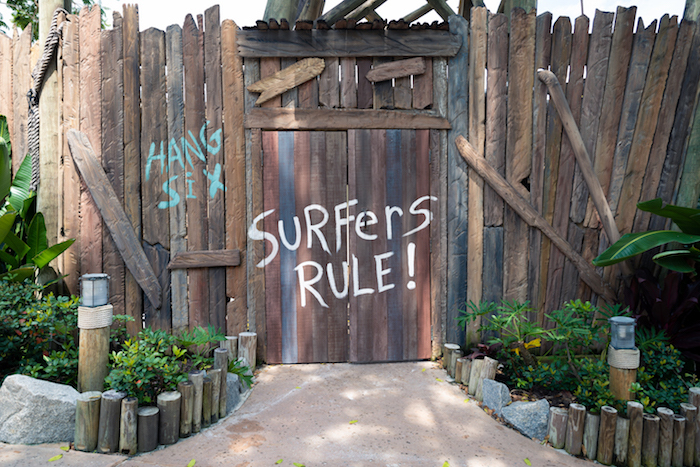 This past Saturday was National Water Park Day, and to celebrate we spent the entire day at Typhoon Lagoon! 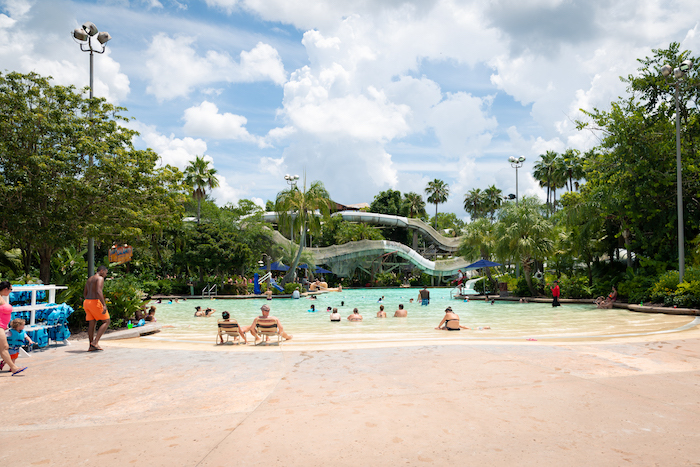 This is one of my favorite water parks because it has so much to offer. 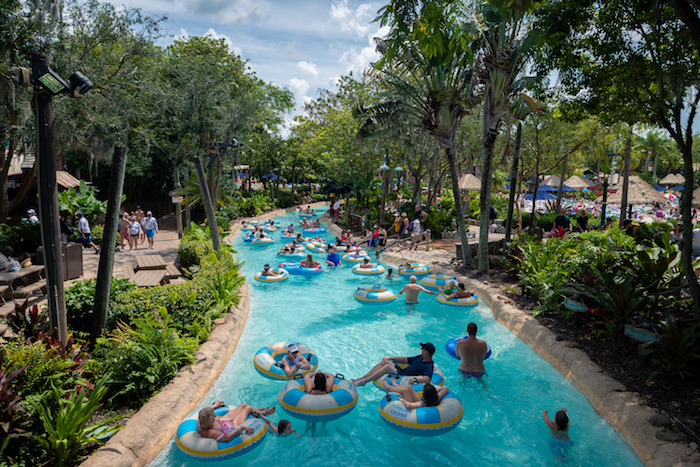 Whether you love braving intense water slides or would rather relax in the lazy river, Typhoon Lagoon has something for everyone. Before we get into our tour, let’s talk about theming! 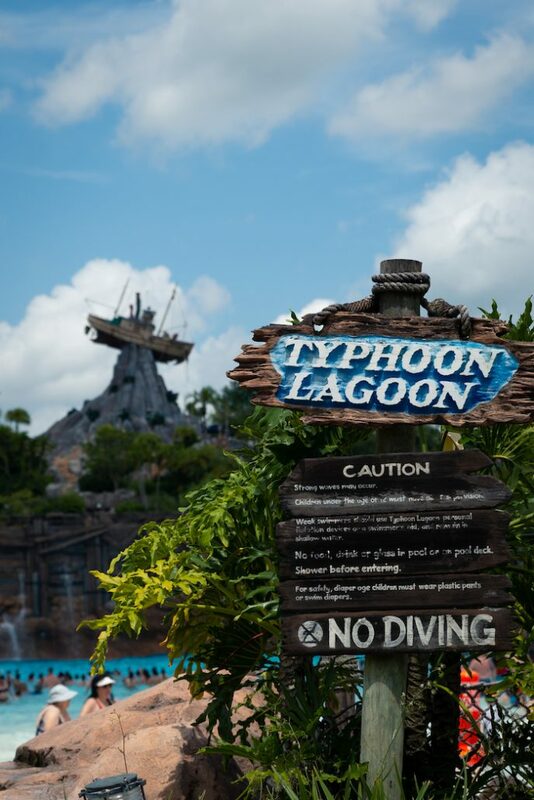 Did you know that Typhoon Lagoon has a backstory? It does! It is said that a massive typhoon is to blame for the destruction of what once was a tropical paradise. A small fleet of ships was tossed from the sea by this typhoon and its debris rained upon the Placid Palms Resort. 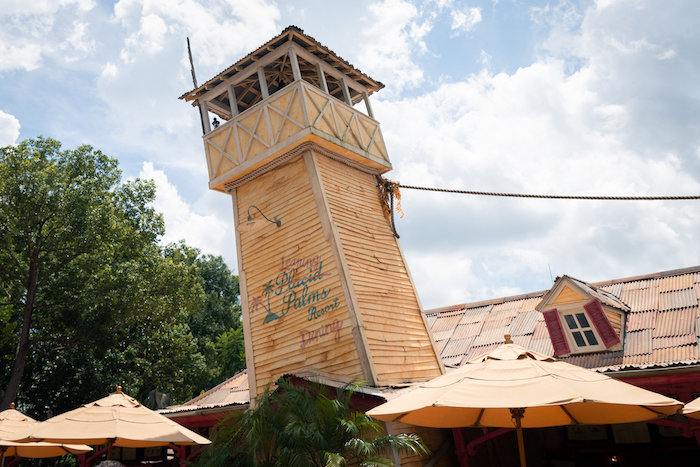 One of the shrimp boats, Miss Tilly, can be found stuck atop Mount Mayday, causing the mountain to erupt. The resort decided to take advantage of this new landscape and create a water park from the newly formed pools, rapids, and waterfalls. Pretty cool, huh? 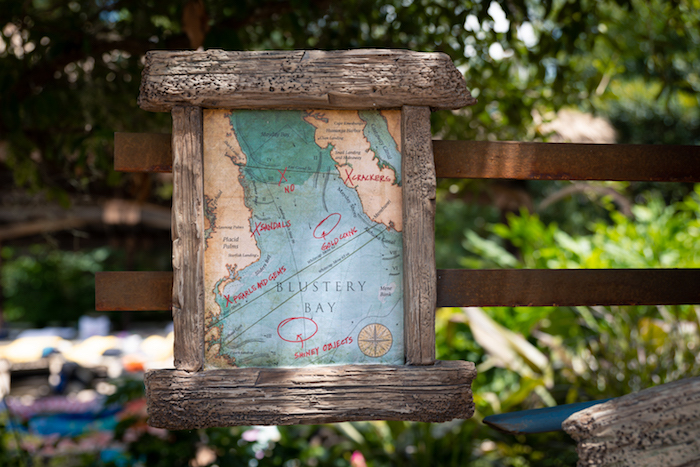 Details found around Typhoon Lagoon. Photo by Courtney Reynolds. 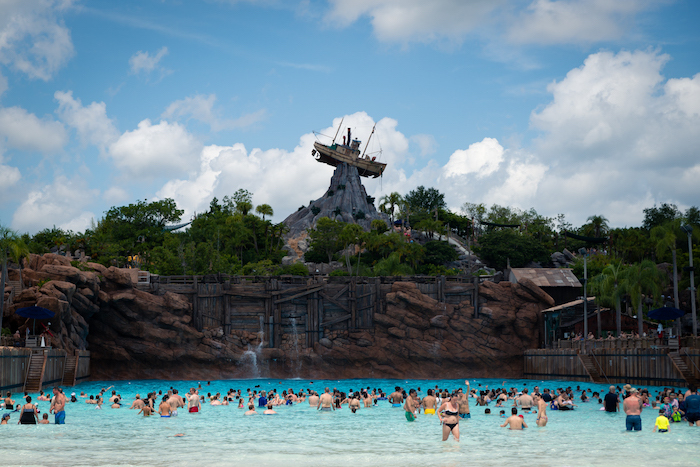 One of the most popular spots is the Typhoon Lagoon Surf Pool. On the surface, it looks just like an ordinary pool, but this wave pool boasts intense 6-foot swells and the title of North America’s largest wave pool. This is the central hub of the park and can be accessed (and seen) from pretty much anywhere! Typhoon Lagoon Surf Pool. Photo by Courtney Reynolds. Another favorite is Castaway Creek, otherwise known as the lazy river. 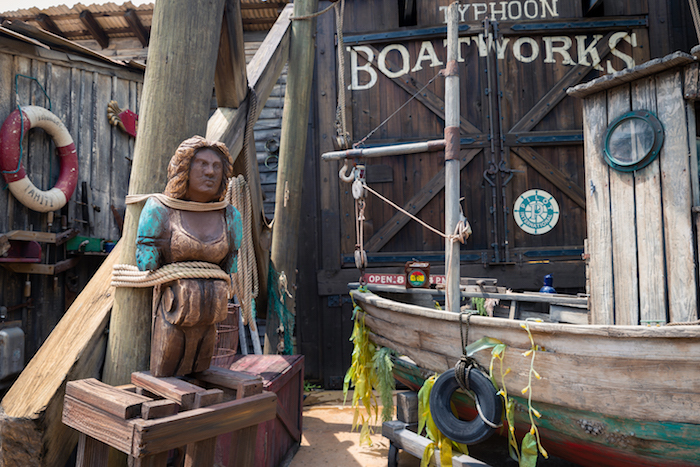 You can get a great view of the detailed theming while floating along Castaway Creek. It’s also a great place to relax and cool off. Castaway Creek. Photo by Courtney Reynolds. Atop Mount Mayday are two single-rider raft slides, Keelhaul Falls and Mayday Falls. There is also a family raft slide, Gangplank Falls, which can seat up to four riders. Experience white-water rapids as you wind your way around the twists and turns of Mount Mayday! 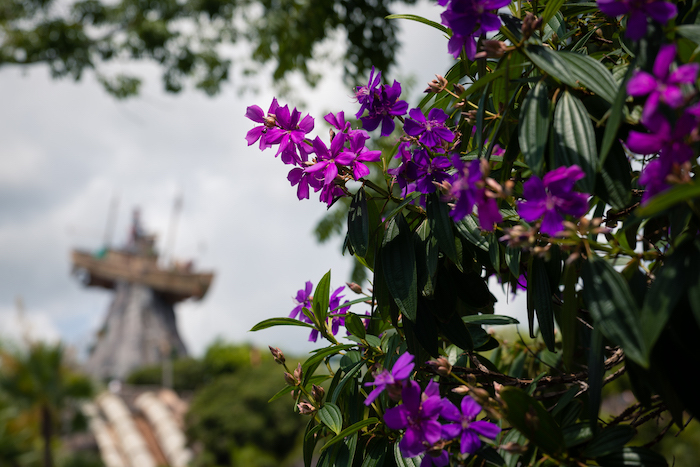 “Hidden” Mickey atop Mount Mayday. Photo by Courtney Reynolds. Located on the other side of the park is Crush ‘N’ Gusher, which seats two riders and has three different slides to choose from. This is my personal favorite! It’s perfectly themed as a run-down fruit packing plant that was destroyed during the typhoon. These slides are intense but fun enough to ride over and over again! 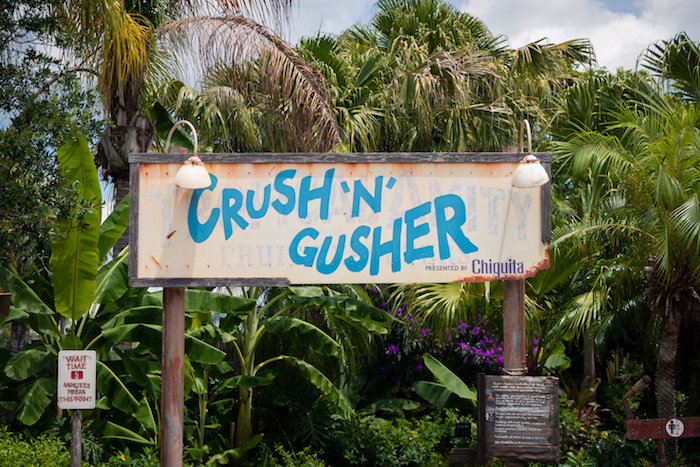 Sign for Crush ‘N’ Gusher. Photo by Courtney Reynolds. Hideaway Bay at the end of Crush ‘N’ Gusher. Photo by Courtney Reynolds. 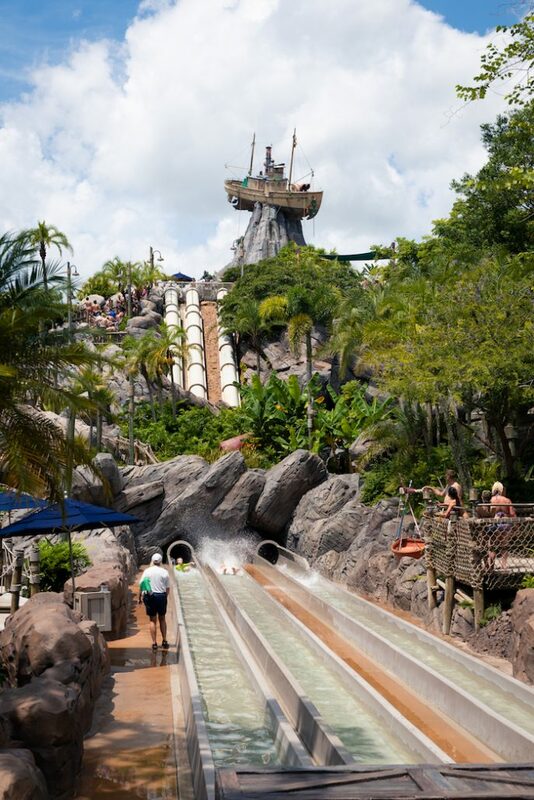 Typhoon Lagoon’s newest ride is Miss Adventure Falls, which is another family raft slide. This is by far the best themed attraction at the park. 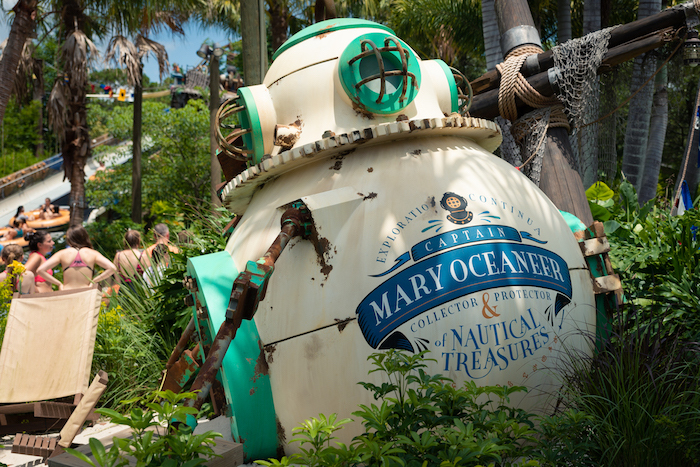 It tells the story of Captain Mary, an oceanographer and member of the Society of Explorers and Adventurers. She traveled the seven seas collecting all kinds of treasures, but her ship and artifacts were among those swept ashore by the typhoon. 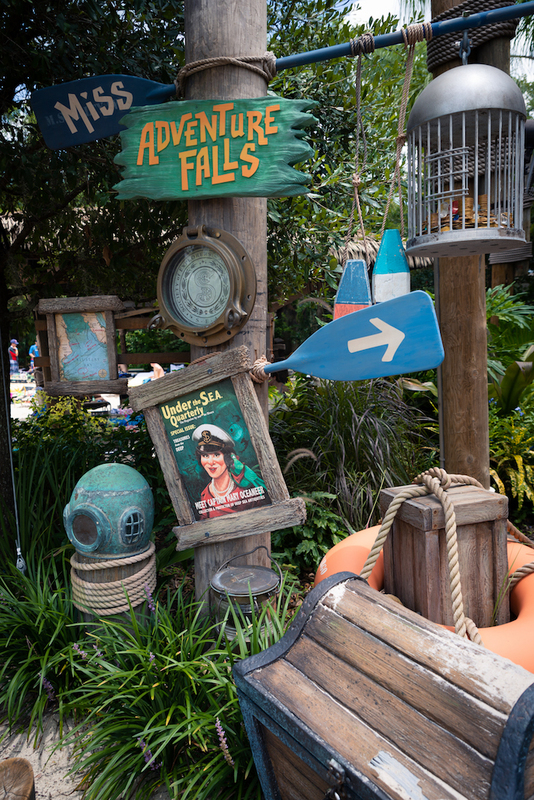 The locals discovered the shipwreck and turned it into Miss Adventure Falls! 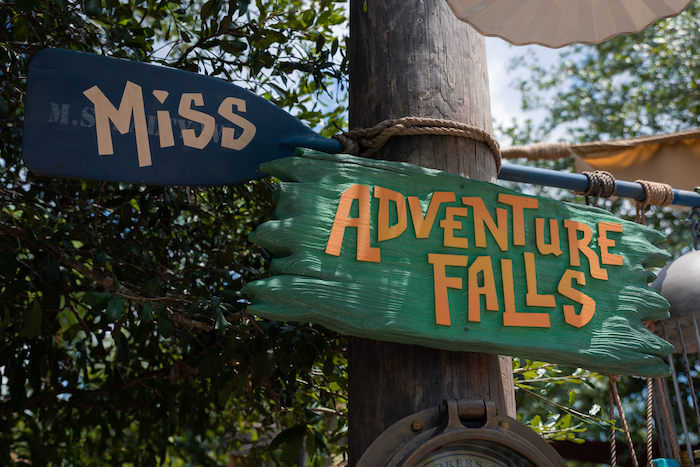 Miss Adventure Falls. Photo by Courtney Reynolds. Atop Mount Mayday are two sets of body slides for you thrill-seekers, Storm Slides and Humunga Kowabunga. These slides aren’t for the faint of heart! Storm Slides is a three-story winding journey down Mount Mayday, which already sounds pretty intense. Humunga Kowabunga is somehow even more intense, boasting a five-story drop. But wait, there’s more! This isn’t an ordinary five-story drop. Oh, no. This journey down Mount Mayday happens IN THE DARK! If you are brave enough to take that plunge, then I salute you. Humunga Kowabunga. Photo by Courtney Reynolds. For the children, there is a water play area called Ketchakiddee Creek, which features bubbling fountains, interactive games, and a small water raft slide. This area also has a set of water slides of its own, perfect for children who are not tall enough or ready for the bigger slides. 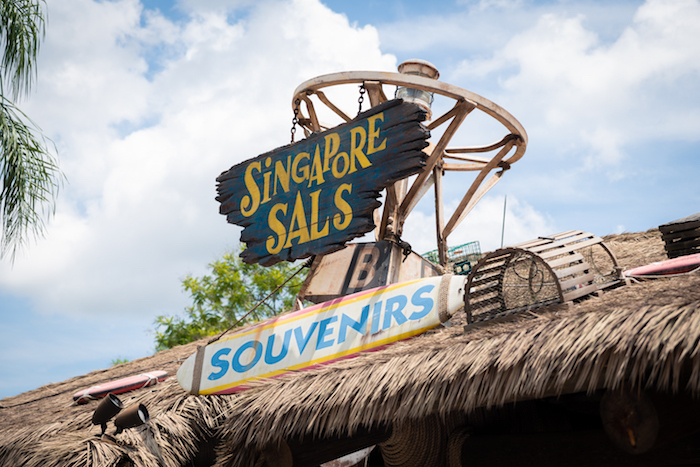 If you’re looking for Disney merchandise or water park attire, then you’ll want to check out Singpore Sal’s! This is also where you’ll find the FuelRod swap station. Right outside the shop, there’s a meet and greet location for Lilo and Stitch, where they take turns meeting guests throughout the day! Singapore Sal’s. Photo by Courtney Reynolds. 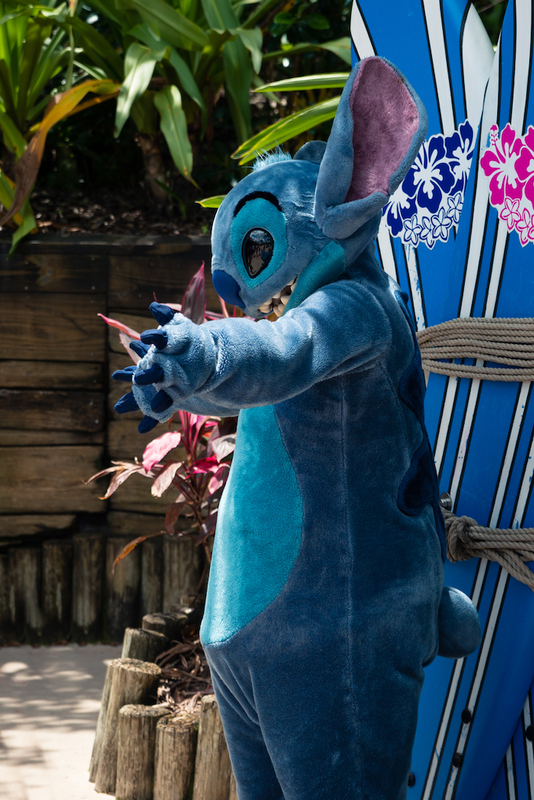 Stitch meet and greet at Typhoon Lagoon. Photo by Courtney Reynolds. One of my favorite snacks to get at Typhoon Lagoon are the mini donuts! They’re the perfect snack size and are surprisingly refreshing even in the summer heat. We got a half dozen, which is $4.89 plus tax. You can also get a dipping sauce for it for $1.59 plus tax. They have chocolate, raspberry, and white chocolate. The donuts are already lightly coated in sugar, so I personally don’t even get a dipping sauce. They’re sweet enough on their own! 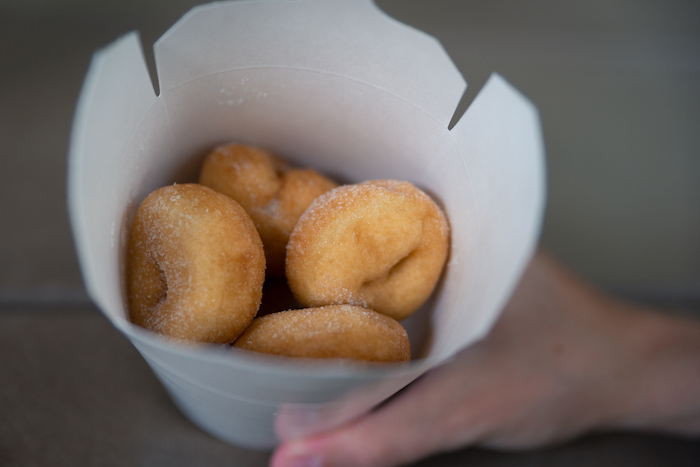 Mini donuts. Photo by Courtney Reynolds. 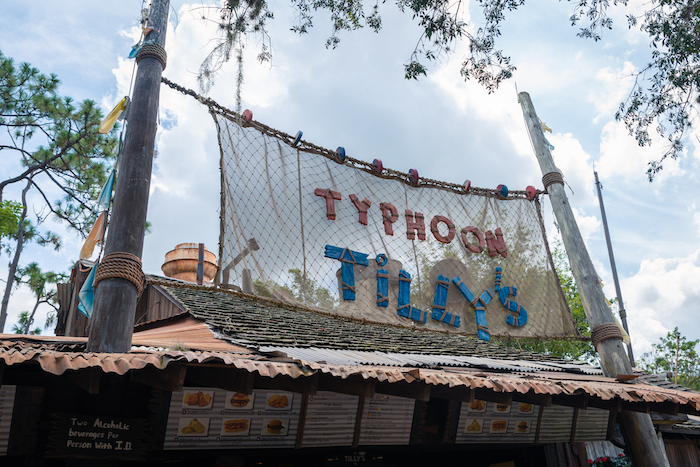 For lunch we visited Typhoon Tilly’s, which features a variety of items from fried seafood to BBQ sandwiches. 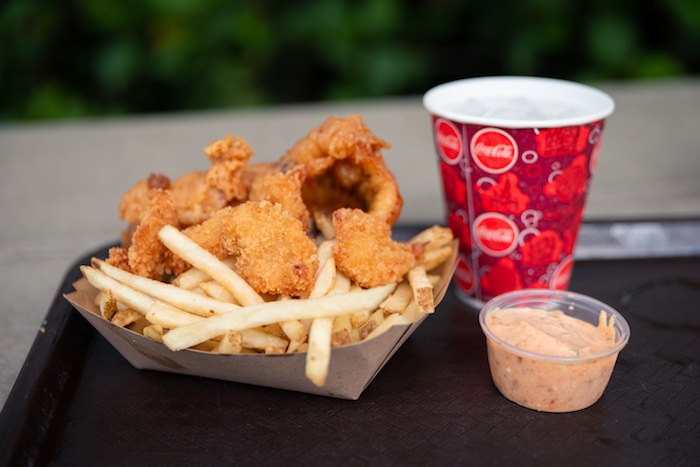 We opted for the shrimp and fish basket for $10.99 plus tax. The fish wasn’t as good as Yorkshire County Fish Shop at Epcot (Let’s be real, is ANY fried fish better than that?) but it was still very good and satisfied my fried seafood craving! Typhoon Tilly’s. Photo by Courtney Reynolds. Shrimp and fish basket from Typhoon Tilly’s. Photo by Courtney Reynolds. 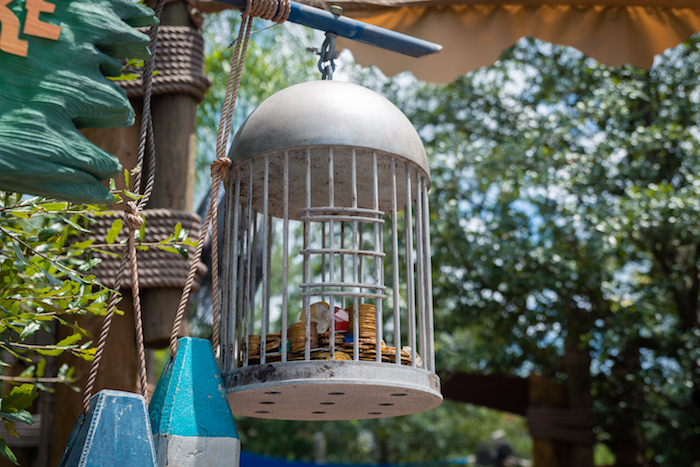 By far the most popular place to eat at Typhoon Lagoon is Leaning Palms, which features a wide variety of items from burgers, salads, pizza and more. This restaurant also has a large outdoor covered seating area. Leaning Palms. Photo by Courtney Reynolds. If you’re craving dessert, you’ll want to check out Happy Landings Ice Cream, where you can find the famous Sand Pail Sundae. 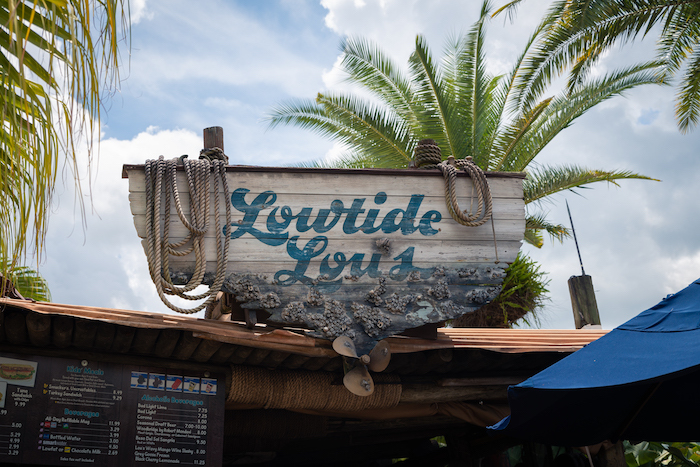 Other places to grab a bite are Snack Shack and Lowtide Lou’s, which both feature a variety of wraps and sandwiches. However, Lowtide Lou’s is only open seasonally. Lowtide Lou’s. Photo by Courtney Reynolds. 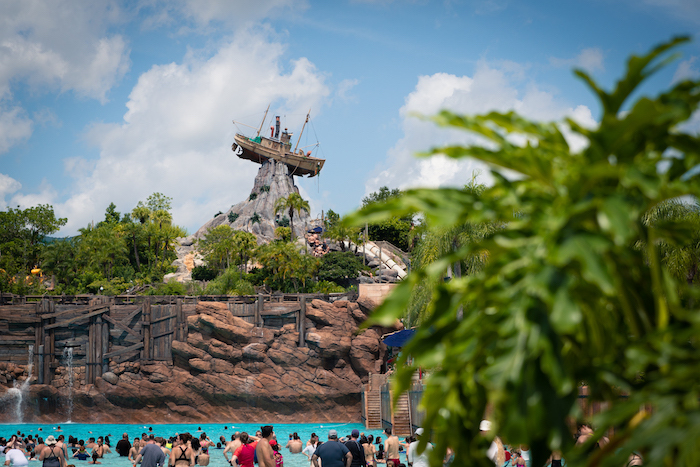 Now what could be better than spending all day at Typhoon Lagoon? Spending all day AND all night there! Thanks to Disney, we got to do just that! The second half of our National Water Parks Day celebration was a chance to experience the new H2O Glow Nights event at Typhoon Lagoon. Stay tuned for an in-depth look at this exclusive event in a future blog post! 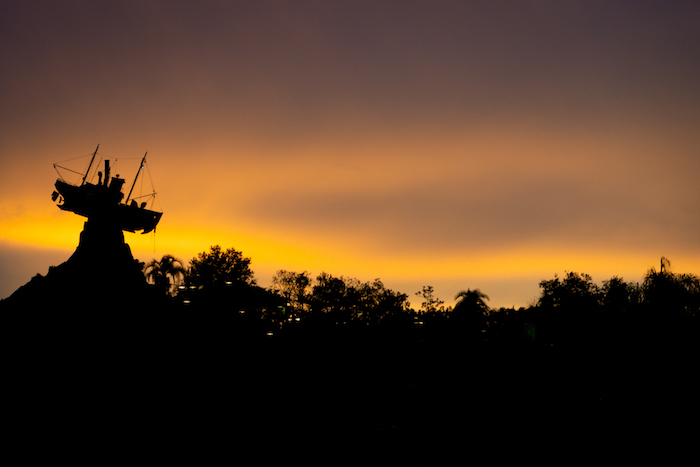 Typhoon Lagoon at sunset. Photo by Courtney Reynolds. Huge thanks to Disney for providing us with admission to the park so we could give you this in-depth look at Typhoon Lagoon! Thanks to our photographer, Courtney Reynolds, for her coverage of this event! See more from Courtney here. 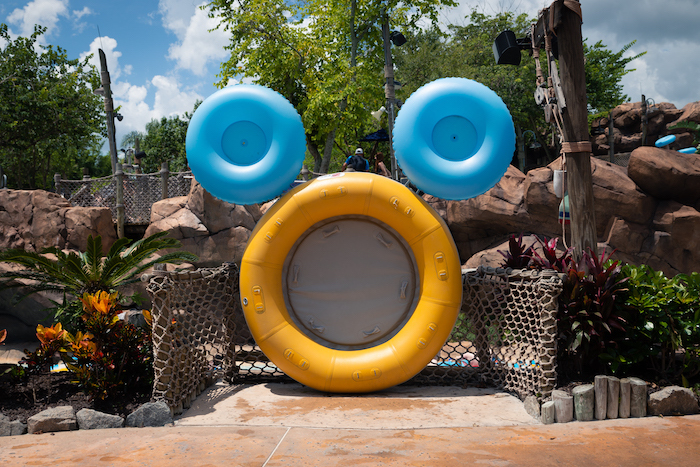 Want to learn more about waterparks at WDW? Subscribe today!